Bontempi Casa was started up in 1963. It has always been based on the same obsessive pursuit of quality and daily passion for our work. There's just a difference between those days and today: the growth of our company's size and experience, even though our approach to business remains the same. We are still determined in proposing our philosophy: experiencing the beauty together with functionality and comfort, always innovating our choices. Our history is based on people prior to projects, a company made of people that every day work to turn dreams into products. In our company's lifetime, we have remained protagonist of a greatly entrepreneurial venture, aimed for the best interpretation of lifestyles and most contemporary trends. Our passion is to turn raw materials into design pieces, thanks to our tremendous experience. Successful results have been achieved due to hardworking and passion of the owners and all the employees who have contributed to build up our story, as of 1963. Enthusiasm is the sentiment leading us and every day we manage our work with positive attitude, trying to transfer such an attitude to people who decide to work with us. This way we cooperate all together with strong committment and determination, making every target a challenge and carrying out ambitious and gratifying plans. Our main goal is to meet expectations of our clients with our utmost committment and thanks to this philosophy, not only are we able to meet their needs, but also to improve our skills mutually. We promote innovation in every single detail of our job. Our products and procedures are the outcome of a constant research, research in terms of design culture, research in discovering new trends, research in anticipating consumer needs, research that finally turns into refinement. Hundreds of sketches are in the hands of creative minds traveling around the world, thousands of sketches come back to our desks. From there a big internal work starts, requiring selection, sensitivity, foresight. Bontempi Casa has always been committed to safeguard of natural resources. All the Bontempi Casa production is conceived and manufactured with extreme care concerning the eco-sustainability of materials used. Manufacturing processes and finishes are carried out, avoiding treatments with harmful substance emissions that can be noxious to human beings and environment. Bontempi Casa uses non-polluting, solvent-free and plastic-free paints, recyclable glass, wood selected in forests managed according to strict environmental, social, and economical standards. Bontempi Casa invests on environmental sustainability, through responsible use of our resources. Our objective is achieving EXCELLENCE in every single thing we do, the continuous improvement of our quality standards, that reflects the Made in Italy EXCELLENCE. Every single day we work on new techniques, new design concepts, new products to develop the best solutions for any kind of environment. The Bontempi Casa dream is to furnish a space to make it more pleasant and cost, space where you can comfortably experience and enjoy your life. 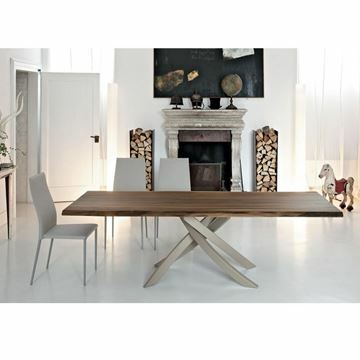 The Artistico Dining Table by Bontempi Casa. As it's name states, the artistic flare of the steel base makes this design functional art for your home. Each walnut slab is unique to itself featuring a beautiful natural live edge. As many natural characteristics of each slab are preserved in the finished piece. Polished acrylic is utilized when necessary, again as an effort to preserve and celebrate the beauty and nuance of each wood slab. A wonderful statement of Italian artisan creativity and unparalleled quality. Aside from the beauty of the 98" long natural walnut and finished base as shown, eleven additional metal finishes makes the Artistico perfectly suited for customization.